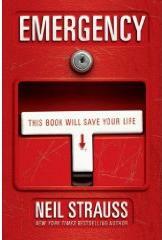 Neil Strauss is releasing his new book “Emergency: This Book Will Save Your Life” March 10th in the US. This marks his first full-length work since “The Game” back in ‘05. It’s described by the publisher as “one man’s story of a dangerous world and how to stay alive in it”. The non-fiction title is about all the dangers in the modern world; terrorism, the economic downturn and climate change. Strauss decides he has had enough and investigates getting second citizenship on a Caribbean island along with learning how to shoot a man and get away with it, butcher and eat a goat and other ’survival’ tips. Wait… Neil Strauss is writing a “survival guide”?! I’ve had the impression that Neil is one of those guys who would call an ambulance over a hangnail! That being said, Neil is obviously a great writer and hopefully he can pull the book off and make it interesting. If my memory is correct, didn’t Neil write for Rolling Stone?! Gee, I wonder if they may be a bit biased! Neil is insane talented (or worked really hard for a long, long time to learn how to write). I am so glad he’s actually writing about something other than glitz and glamor for a change.